Synopsis: When Greg Sestero, an aspiring film actor, meets the weird and mysterious Tommy Wiseau in an acting class, they form a unique friendship and travel to Hollywood to make their dreams come true in The Disaster Artist. In 2003, an ambitious dreamer named Tommy Wiseau got frustrated with waiting for his big Hollywood break, so he made that break himself by writing, directing, and starring in The Room. Initially ridiculed, The Room has gone on to become the biggest cult film of the twenty-first century. 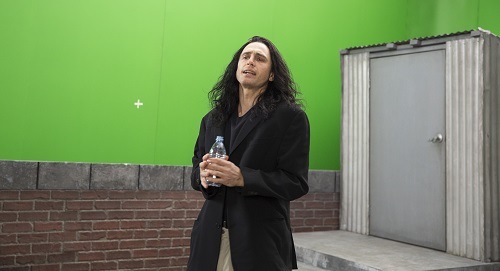 Wiseau’s partner in crime, Greg Sestero (Retro Puppet Master) wrote a book called The Disaster Artist about the experience of making The Room, and indie hero James Franco (Spring Breakers, True Story) has adapted that book into a masterpiece that the world needs right now. The Disaster Artist stars James Franco as Tommy, a struggling thespian who meets new-found fast friend Greg (brother Dave Franco from Now You See Me) in an acting class and convinces him to move to Los Angeles so that they can have a go at becoming movie stars. Tommy has an apartment in LA and a seemingly endless supply of money, but what he doesn’t have is acting talent. Sad and discouraged by all the rejection, Tommy decides to write his own movie and direct it himself, of course casting himself and Greg in the starring roles. Inexperienced and naïve, Tommy and Greg fumble their way through learning how to make a movie, and The Room is born. The only thing crazier than The Room is its backstory, and that’s what’s presented in The Disaster Artist. Based on Sestero’s book that was co-written by Tom Bissell (Salt and Fire) and adapted for the screen by Scott Neustadter and Michael H. Weber (the pair who also wrote The Spectacular Now, Paper Towns, and The Fault in our Stars), the script captures all the zaniness and camp of the story, and never lets the story get too deep, even during those rare moments when it’s not a complete laugh riot. James Franco’s masterful direction embraces that attitude even more fully, so The Disaster Artist is every bit as much fun as The Room. It’s just made a hell of a lot better. None of the humor and silliness in The Disaster Artist is unintentional or accidental. Everything is just as James Franco has drawn it up in his fit of creative genius. For as nutty as the movie is, there is a lot of heart to The Disaster Artist. At the core of the film is the friendship between Tommy and Greg. That friendship is built on faith and trust, and that foundation gets tried and tested throughout the course of the narrative. The entire time, however, the viewer can tell that there is genuine affection between the guys that results in an all-for-one attitude and that attitude mean that they will stop at nothing to see their dreams come true. 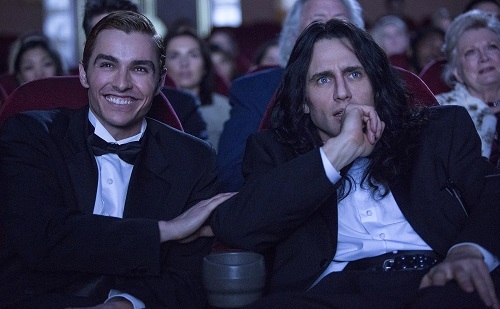 But even the heartfelt bromance between Tommy and Greg doesn’t turn The Disaster Artist into a sugary sapfest. There’s enough to make it a feel-good movie, but not enough to distract from the overall hilarity and corniness. The only tears in The Disaster Artist are tears of laughter. 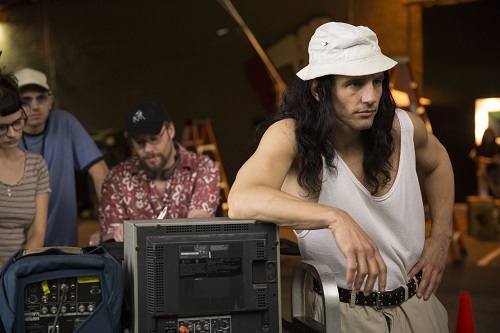 Only Wiseau and Sestero know for sure how accurately the events of The Disaster Artist are portrayed, so for the rest of us, let’s just buy into it and hope that everything in the film happened in real life exactly as it does onscreen. Because the events that unfold onscreen are incredibly entertaining, and to think that it happened any other way would just be a disaster. Since the focal point of The Disaster Artist is the relationship between Tommy and Greg, the chemistry between James and Dave Franco is of the utmost importance. Maybe it’s because they’re brothers, but the on-screen banter between the two actors is great fun to watch. James Franco has the Tommy Wiseau accent and mannerisms down pat, and it’s difficult to not imitate him imitating Tommy when talking about the film (“oh, hai, Mark!”). And when he acts like Tommy trying to act, well, let’s just say it takes a lot of talent to be able to sell a scene while acting so poorly. For his part, Dave pretty much plays the straight man and keeps out of James’ way, and that works well; the movie doesn’t need two Tommy Wiseau’s. The rest of the cast is fairly by-the-numbers. Franco did a great job at picking a supporting cast that bears striking physical resemblances to the real-life actors from The Room. The cast-within-the-cast includes fine players like Ari Graynor (Wiener-Dog), Zac Efron (Neighbors), Josh Hutcherson (The Hunger Games), and Jacki Weaver (Silver Linings Playbook), and the filmmaking-crew-inside-the-film features Seth Rogen (This is the End) and Paul Scheer (“The League”). Oh, and Alison Brie (“Community”) appears as Greg’s girlfriend and Megan Mullally (“Will & Grace”) pops in momentarily as his mom. These all seem like Franco pals who, although they all do serviceable jobs with their roles, are probably just there to be a part of this fantastically crazy movie, and who can blame them. The Disaster Artist is an absolute blast. It’s the kind of movie where the audience is either doubled over laughing, or they are smiling ear-to-ear, just waiting for the next batch of funny. The obvious comedic anchor of the film is James Franco’s Tommy Wiseau, and Franco nails the character in a lovingly humorous way. But the situations that Tommy and Greg find themselves in are hilarious as well, and the whole film is so ludicrous that, by the end, the audience and characters are laughing together, not at each other, but with each other. The Disaster Artist is worth seeing in a movie theater for that reason alone: it’s almost as communal of an experience as seeing The Room itself. With The Disaster Artist, James Franco has developed a new kind of modern comedy movie. And it must be seen to be believed.